2017 ''001'' Jingmai Old Tree Raw Pu-erh 357g Cake Lancang Gucha Pu'er Puer Tea by Wisdom China Classic Puer Teas at Jakis Cafe. Hurry! Limited time offer. Offer valid only while supplies last. Mountain: Jingmai. This cake is the king product of Lancang Gucha!Pure ming qian(Before qingming) old tree leaves! Brand: Lancang Gucha.A very famous tea factory located in Jingmai area. It was established by Ms. Du Chunyi,they always call her Mother Du, she is one of the most famous tea man in pu-erh world and the factory is the top-rated puer tea maker now! Quality products from WISDOM CHINA Store! Welcome to Wisdom China! Best things from China for you! More wonderful things in our store! 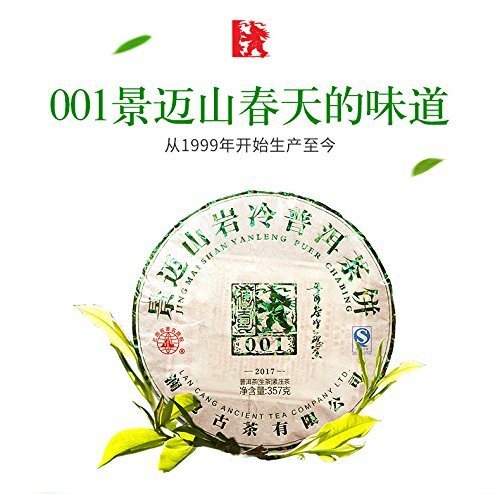 If you have any questions about this product by Wisdom China Classic Puer Teas, contact us by completing and submitting the form below. If you are looking for a specif part number, please include it with your message.